Michelin's best standard passenger car/minivan tire ever offering 90,000 miles4of confident driving through exceptional safety, longevity and a quiet, comfortable ride so that you can protect those you care about most. Tires are usually named with a series of codes. For example, one of the recommended tires for Vanagons is the 'Yohohama Y356 LT 195/75 R14 (load range D)'. The latter part of this (195/75 R14) is a uniform code assigned to tires. This section tells you how to intepret this code. Wheel diameters are usually in inches and tire width in millimeters or a letter designation. In our example of '195/75 R14', '195' is the tire width in millimeters, and '14' is the wheel diameter in inches. The shoulder height is stated as a percentage of the tire width. For example, in '195/75 R14', the shoulder height is 75% of the tire width (195mm), or 146.25mm. The load-index figure denotes the maximum load capacity of a tire when driven at maximum speed. Note that you have four tires, so you should multiply the load index value by approximately 4. Vanagons & Syncros need a load rating of at least 97, while Syncro 16" need a load rating of 104. What is the diameter of a tire? Here's a table of tire diameters by width and profile, for your speedometer correction calculations. Eurotire, a nice-to-deal-with tire distributor in NJ, used to include this info and more in their catalogs. Diameters are in millimeters, with tire installed on narrowest rims approved for that tire size. Wider rims would give slightly smaller diameter. See warranty section below for information. "When I replace tires Michelin is the one for me. I have never had a problem with your tires. " When I bought the Vanaru - it had already had a Subaru EJ22E engine conversion kit installed in it. This was done by a Aircraft Mechanic and a Fire Captain - so the work was quite good. They had snipped all the lines for the A/C. Are you considering upgrading the wheels on your VW Vanagon? There are a number of good reasons to upgrade your Vanagon wheels, and the primary ones are safety and better handling. But don’t just go with any larger wheels, make sure to get the right ones. The 14” wheels that come standard on a VW Vanagon are literally just too small to do the job. You may already know that it’s impossible to find tires that fit the standard Vanagon wheels and meet the safety requirements for the weight of the vehicle. Weighing in at over 4,000 pounds, no tires that fit the original 14” wheels are load-rated for the weight of the van. Of course, many people–yourself included perhaps–use 14” tires and get by for many years without accidents related to the weight of the van. These people, however, are the ones who have to hold the steering wheel very tight (while praying to their angels) on a freeway to counteract the wobbling effect of a passing truck or strong cross wind. You see, the original VW Vanagon wheels are 14” x 5.5”. This means the diameter of the wheel is 14” and the width (or “depth”) of the wheel as measured from the outside of the car toward the center, is 5.5”. When you upgrade your Vanagon’s wheels, you’ll be looking at wheels ranging from 7” to 7.5” in width. So with the originals, you’ll get blown all over the road, but the bigger wheels are wider, so there is more tire in contact with the ground at any time. As a result, the van will handle much more smoothly, you’ll have increased stability, and, you won’t feel every single bump in the pavement anymore either. So if you’re convinced that you want more stability, a smoother ride, and a higher safety standard, the next question is what kind of wheels to get for your VW Vanagon. Because the upgraded Vanagon wheels are wider, many wheel upgrades require the use of a spacer in order to make sure the tires don’t sit too close together. Spacers are also used when the bolt pattern of a wheel doesn’t match the original bolt pattern on the car. The bolt pattern describes the diameter of the imaginary circle between the centers of the lugs on the wheel. The Vanagon bolt pattern is 5 x 112. The first number in a bolt pattern, in this case, “5” refers to the number of bolt holes on the vehicle. The other number, “112” refers to the diameter of the imaginary circle created by the 5 bolt holes, which measures how far apart they are. On Vanagon wheels, this is measured in millimeters, so 112 mm is 11.2 cm or just under 4.5” inches. If your new Vanagon wheels don’t have the same 5 x 112 bolt pattern, then a spacer may be used to “convert” the wheels. There are two main drawbacks to using spacers, one more mechanical, one more cosmetic. Spacers can put an extra load on the wheel bearings, and they can also make the tires stick out beyond the fenders. Vanagon wheels are generally made of either steel or aluminum alloy. Steel wheels are heavier, cheaper to make, and although they are durable, they’re ugly. That’s why steel wheels almost always are covered by hub caps. The alloy wheels are stronger, lighter, and because of their aesthetic appeal, do not require hub caps. When you choose your Vanagon wheels, it’s worth it to go for the alloys. And since different wheels have different designs so you’ll want to pick one that highlights the unique style of your VW Vanagon. So when you’re considering the different types of Vanagon wheels, look for 15” Alloy wheels that have a 5 x 112 bolt pattern and don’t require spacers. Hopefully this article has helped you gain a better understanding of why you might consider upgrading your Vanagon wheels and what to look for when you do. The Michelin Defender is the manufacturer's premiere "all season" tire, designed to handle dry, wet, wintry conditions (even light snow). It features a technologically-advanced traction system to evacuate water and enhance resistance to hydroplaning. The tread wear rating is amazing (820!) and the driveability is simply off the charts. This is the most "street" tire we offer, but it still handles surprisingly well off-road. We carry both the 215/65-15 and the 215/60-16 for the Vanagon. The other tire we offer is the BFG A/T KO, available in either 215/70-16 or 225/70-16, depending on gearing and engine size. The BFG is the most aggressive tire we offer, and probably the best all-around on/off-road tire available today. It is a bit noisy on pavement, however (that's the trade-off for supreme off-road ability). So, with regard to on-road handling, the disparity between the tires is not as great as the disparity when it comes to off-road traction and performance. The main draw back with the BFG is road noise and fuel economy; they tend to be noisy—especially under 50MPH—and are not as fuel efficient as the smoother tread tires. The Defender will outlast either the BFG by around 2:1. The Defender is the most smooth, and most fuel efficient. Hopefully, this analysis helps when choosing a tire. The folks at Michelin recently paid our offices a visit to give us a technical rundown of its latest tire, the Michelin Defender. Though the full impact of the engineering wizardry that went into Michelin’s new standard touring all-season may be lost on most consumers, a few things caught our attention. Michelin’s data showed that car owners were keeping their cars longer, meaning vehicles on the road are racking up more miles and conceivably going through more tires than before. To appeal to this increasingly common customer, Michelin launched its Defender line of standard tires earlier this year, which lasts longer and nets better fuel economy compared to the tires it replaces. The Defender has a 90,000-mile/6-year treadlife warranty, and replaces the previous Harmony and HydroEdge series. Michelin says the tire’s silica-based compound offers good all-season grip and stopping performance, while also providing low rolling resistance for higher efficiency and longer service. Though the compound itself was fascinating, the Defender’s innovative tread design is what sets it apart from its predecessors. One thing Michelin had to explain to us was the advantages and disadvantages of sipes, the grooves cut into a tire’s compound that make up its tread pattern. A sipe creates an edge that can bite into a surface, providing better grip especially in snow or dirt. Sipes are also good at removing water from the contact patch, and help prevent hydroplaning. But cut too many sipes into a tire, and the tread begins to lose rigidity. Michelin attempts to address this problem with its Intellisipe Technology, which strengthens the tread by molding the sipes in a way that interlocks the tread blocks. By doing so, Michelin can cut many more sipes into a tire without sacrificing rigidity. This feature by itself isn’t new, but Michelin combined it with its Variable Thickness Sipes (VTS) technology, to further stiffen the Defender’s tread. With the addition of VTS, a series of lateral ridges that vary in thickness get molded into the inside walls of the sipes. Michelin showed us an illustration of a cross-section of one of the Defender’s many sipes—blown up by what must be hundreds of times actual size. Seeing this made clearer how the two technologies increase rigidity, and also made us wonder how this thing is molded. Even if that process wasn’t a closely guarded secret, we’d probably struggle to wrap our minds around its complexity. With its stiffer tread, the Defender has the same rigidity with less mass, always a plus when it comes to cars. All of this unseen tech helps the Defender exceed the performance of its predecessors, Michelin says. The tire maker claims the Defender can outlast its direct competitor Continental Pro Contact Eco Plus by up to 21,000 miles, while also being able to outbrake the Goodyear Assurance ComforTred Touring by up to 31 feet in the wet. Michelin also claims the Defender can save up to $250 in fuel over the life of the tires, based on a 90,000-mile test against competitor Yokohama Avid TRZ. Currently, no new cars come with Defender as original equipment, and Michelin instead hopes to attract customers shopping for their first set of replacement tires – and if the 90,000-mile rating is accurate, it might be the only set of replacement tires they’ll need. Michelin says the Defender will offer more technology, but remain within the same price range of its predecessors. Tire makers themselves do not set prices, but Michelin says a standard size like 215/55R15 might cost about $125 per tire on average. With the range of sizes offered in the Defender line, Michelin says the tire will cover 93 percent of the market. Typically, if it’s not super-sticky, high-performance rubber, we’re not all that excited when new tires come out. But Michelin has some interesting ideas in the Defender, and if the tires can truly last up to 90,000 miles in the real world, the company might raise an eyebrow or two. 1) I was able to get a Remanufactured Subaru EJ22E Engine sold by Amazon, work done by Proformance Powertrain with a 3 year warranty for $3600 including tax and shipping. It did not include the valve covers and the oil pan. 2) At Tom Auto in Daly City they charged me 1300 in labor to replace the previous Subaru Engine. The shop in Berkeley charges 12,000 for the complete conversion, so so far we are doing allright. 3) Repaint - Maaco Fremont (check yelp) $2200 for body work (i had 2 accidents in it during a difficult time in my life). $1599 for their top paint job. 5) Tires are standard width - will need to replace with wider tires as it is jacked up using Bilsteins. Part & Prices Are For Estimating Purposes Only. 4 - Go to a local hydraulic shop to make the replacement hoses. Bring the ends of the small and large pipes. The large pipe needs 36 inches of A/C hose between the aluminum and steel ends. They will weld a steel connector on the steel (VW) end and an aluminum connector on the aluminum end. Both of these have a steel shell part that is compressed onto the rubber hose. Be sure that the tubing is for A/C application, which can both take the pressure and has a liner for the fluid. 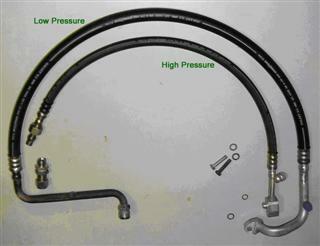 Again, note the orientation marks ('up') on these metal ends (red marks, Slide2) and be sure that the hose is attached with the proper orientation (i.e., the hose can make bends, but cannot twist if the orientation is off too far).For the small hose, 26 inches of rubber hose is needed between the aluminum end and a piece of steel tubing the shop can supply (1/2 inch outer diameter x 3 inch long). For the approach shown, you will also need to buy a ½ inch union (local Swagelok store for $15 in brass or other brand). This way the hoses can be made at the shop, then installed in the van. Fitting orientation is not important for the small hose (final orientation set when union is installed). Be sure to remove the o-rings and valve parts (inside the refill fittings) before welding. Note: 'Universal' parts are designed to work for multiple vehicles. If you are unsure if this part will work on your vehicle please contact us to confirm. Notes: Unichips are preloaded with stock maps, please contact us if you have any power upgrades. Unichips & Unichip Plug 'n Play kits, as well as any software products are sold as is & are NOT returnable for a refund.